Sweeter than Birdsong is the second book from the Sadller's Legacy series (a work of fiction inspired by a real family in American history- the Hanby family, who are to this day the most celebrated citizens of Westerville, Ohio. "Music offers Kate sweet refuge from her troubles...but real freedom is sweeter." In Westerville, Ohio, 1855, Kate Winter's dreams are almost within reach. As the first woman to graduate from Otterbein College, she'll be guaranteed her deepest wish: escape from the dark secret haunting her family. But with her mother determined to marry her off to a wealthy man, Kate must face reality. She has to run. Now. And she has the perfect plan. Join the upcoming musical performance--and use it to mask her flight. Ben Hanby, Otterbein College's musical genius, sees Kate Winter as an enigmatic creature, notable for her beauty, yet painfully shy. Then he hears her sing-and the glory of her voice moves him as never before. He determines to cast her in his musical and uncover the mystery that is Kate. Still, he must keep his own secret to himself. Not even this intriguing woman can know that his passionate faith is driving him to aid fugitives on the Underground Railroad. "Sweeter than Birdsong" is a stirring novel of hope and faith inspired by real historical people and events. 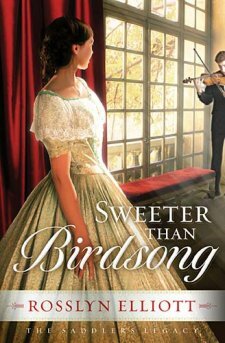 I hadn't read the first book in the series but it didn't matter and I was able to read Sweeter than Birdsong as a stand alone book. The characters drew me in and the careful historical descriptions throughout transported me back in time to 1855. If you like historical romance you'll enjoy this book.